The biggest match of club football offered everything fans wished for and more. Kyiv played the perfect host to a perfect match played out between Spanish giants Real Madrid and thrilling English team Liverpool. 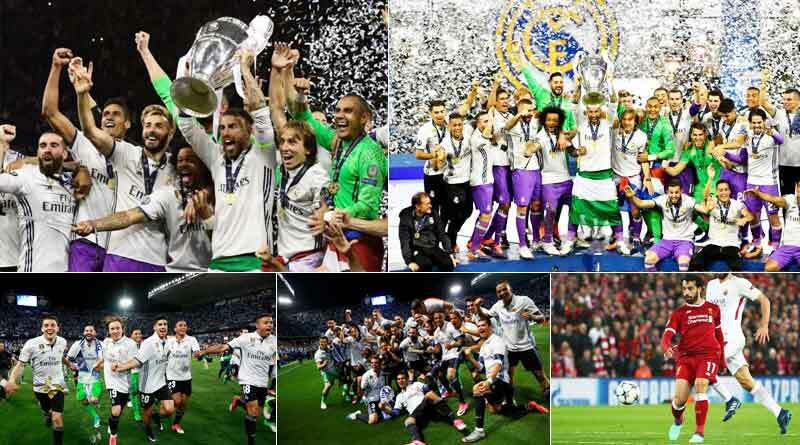 It was Real Madrid however who had the last laugh as they romped to a 3-1 victory on the night to lift their 13th Champions League title and also made it a hattrick of final wins for them. The capacity crowd was treated to a mesmerising closing ceremony that saw singer Dua Lipa perform some of her best singles. Grooving to her music, dancers lit up the big night to set the stage perfectly for the battle that was to ensue. Coming back to Champions league final 2017-18, With the two best attacking sides taking on each other, goals were promised and the teams did not fail to deliver them to us. Cristiano Ronaldo and Mohammed Salah were going to be game changers for their sides, with the duo sharing 88 goals between them, both having scored 44 each this season. The tale was decided by Gareth Bale and Laurus Karius; with one turning out to be the heroes for his side while the other the villain. A theatrics and dramatic final treated viewers around the world, millions of those at that, to one of the most thrilling finals in the history of the champions league. Liverpool stated the match strongly, playing with their usual intensity, attacking right from the word go to peg back an experienced Madrid side. Madrid however saw off the storm pretty quickly to get back into the game ad where given a big boost in their chances of winning the match when Liverpool star and their main payer Mohammed Salah was forced off the pitch. The Egyptian was bundled to the ground by a nasty tackle by Madrid captain Sergio Ramos and suffered a heavy blow to his shoulder which ended his night. His departure shifted the tide in Madrid’s favour who opened up immediately after Salah left the pitch, knowing that they could now focus a little less on the defensive side of the game. A goalless first half saw 4 being scored in the second. Liverpool’s dodgy goalkeeper Karius made the worst error possible in a CL final as he passed the ball straight to Benzema who found the back of the net. Mane equalised for the English side soon after though as Liverpool enjoyed a spell of dominance lead by their intense pressing. It was then that Gareth Bale stepped out onto the pitch to write his name all over the final. A bicycle screamer by him gave his side the lead in what will go down as the best goal in a CL final. Another horror blunder by Karius saw him let go of a long ranger by Bale to seal the win for Madrid by 3-1.